Exclusive designer furniture made with oak. Luxurious design combined with outstanding quality, this exclusive collection was revealed at Milan’s Design Week and is the creation of German designer Martin Ballendat. This designer entertainment unit will turn your home into a modern multi-media studio. Metal accents on the doors make it a trendy eye-catcher. Made by one of Europe’s leading luxury furniture manufacturers, located in Austria, exceptional quality is guaranteed as well as the contemporary design. This modern TV and entertainment unit is made of highest quality solid wood (oak or walnut) that is obtained from sustainable forestry and processed with excellent craftsmanship. By purchasing this rounded TV cabinet, you will acquire eco-labeled furniture produced in Austria. The Loft bench and corner bench are crafted with finest solid wood (wild oak or walnut) and offer a variety of options to choose from. There are different upholsteries available such as the high-quality sheeps’ wool Loden or real napa Leather. Create your own luxury furniture item by selecting the side lengths, the dimensions and a suitable size for your table. This designer bench is a very diverse piece of furniture that can be used in various areas of your home. It will create a friendly and modern atmosphere while combining all attributes of a high-end furniture designed by Martin Ballendat. German contemporary design and high quality craftsmanship from Austria are both combined in this Organo dining table. The designer table is available in walnut or oak and has the option of different extensions. This spacious dining table is adjustable to every size that is needed to make it a pleasure inviting all your friends to your home. This luxury furniture item stands for modern interior decoration and simultaneously it will transform your home into a nice and cozy place. In this designer table are all the attributes of a high-end furniture combined. German designer Martin Ballendat used industrial and modern style elements to create an outstanding dining table for your home. 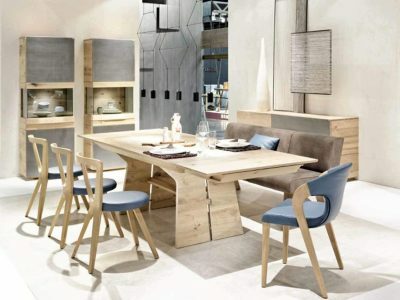 The Tema dining table is crafted in Austria and stands for highest quality. You can choose between different sizes by adding extensions. This designer table is available in oak or walnut wood. Select your preferred solid wood (oak or walnut) according to your interior decoration and taste. The attached extensions allow you to adjust this designer table flexibly to your needs. It can be enlarged or reduced and therefore used in a broad variety of occasions with friends or family. The original design of this luxury furniture item will fit perfectly into the interior decoration of your home. This high-end cabinet is designed by Martin Ballendat and crafted with finest solid wood (oak or walnut) in Austria. Its metal accents on the doors will give your home a modern and stylish touch. You can choose between no metal accents, accents on the doors below or metal accents on all doors. The combination of solid wood, gleaming metal and a display cabinet create a luxurious furniture item with multi-purpose and space for storage. This Organo bench is made out of solid and high quality wood (oak or walnut). It is modernly designed by Martin Ballendat and excellently crafted in Austria. This high-end furniture uses diverse upholsteries such as real napa Leather or the pure new wool “Loden” (100% Merino wool). The orginial designer bench is available in different sizes in order to fit perfectly into your contemporary interior design and diverse areas of your home. The Riviera bed will create a peaceful and relaxing atmosphere in your bedroom. Combining natural warmth, exhaled by the wooden frame, with its contemporary design, this designer bed will take your dreams to new heights. Demand the best bedroom furniture for your home and be assured that every day and night you will admire a perfect setting. The extraordinary German design and Austrian craftsmanship combine perfectly and merge together to give way to a perfectly outlined and expertly crafted structure. Available in two kinds of wood (core beech and oak), this bed must be attached to the wall so that it gives the impression of floating effortlessly. Scroll down for pricing options and accessories. The Riviera nightstand will complete the perfecting setting along with the Riviera bed and the other items (dressing, tallboy, chest of drawers) of this stunning bedroom furniture collection. Combining natural warmth, exhaled by the wooden frame, with its contemporary design, the Riviera line is a designer bedroom furniture collection that will perform beyond your expectations. This collection is for those that demand the best bedroom furniture for their homes. This fashionable Loft coffee table is designed by Martin Ballendat and crafted in Austria. The Loft designer coffee table is solid and superbly shaped, it will create a truly exclusive atmosphere to enjoy your intimate moments with friends and family. This loft table is a multi-purpose furniture item with various options to choose from such as an adjustable height, a revolvable plate or a sliding table. The space for storage and the luminous lighting inside will delight you every day. German design combined with Austrian craftsmanship results in high quality modern furniture. This designer table from the Organo collection by Martin Ballendat is amazingly crafted with oak or walnut wood. It is a multi-purpose luxury product that offers space for storage. The height of the table is adjustable, so it can be used in different positions and living areas. Different table variations of heights, drawers and hatches are available and make this coffee table a stunning and convertible piece of furniture. Inside this designer table you will find a very convenient interior lighting system. Designed by German designer Martin Ballendat and made in Austria, our oak furniture collection encompasses different furniture items for the most exclusive homes and residences: dining and coffee tables, beds, nightstands, chairs and armchairs and even benches.